I admit that I usually don’t get all hyped up about St. Patrick’s Day, but I do get excited about unique ingredients for cooking. So, as promised, here is the second post inspired by a bottle of Guinness Stout (that we somehow managed not to drink this week) which is a wonderful excuse to cook an Irish-themed meal for St. Patrick’s Day. Irish Beef Stew with Guinness is a no-nonsense kind of stew that you would expect from your mother or grandmother. Fortified with stout beer and sturdy root vegetables, this hearty no-frills stew will warm and comfort you – just like a woolen fleece on a misty grey day. As most stews go, this is a humble and forgiving recipe. Add your favorite root vegetables and serve with mashed potatoes. Serves 6. 1. Preheat the oven to 325 F. (170 C.) Heat 2 tablespoons oil over medium-high heat in a Dutch oven or ovenproof pot with a lid. Season the beef all over with salt and pepper. Brown the beef in batches, without overcrowding, 6 to 8 minutes, turning as needed. Transfer the meat to a plate and repeat with the remaining beef. 2. Add the garlic to the same pot and sauté until fragrant, about 1 minute. Add the tomato paste and cook, stirring constantly, 1 minute. Return all of the beef to the pot and stir to coat. Add the stock, beer, thyme, bay leaves, 1 teaspoon salt, and 1/2 teaspoon black pepper. The meat should be just covered with liquid. If not, add additional stock or beer to cover. Bring the liquid to a boil, then turn off the heat and cover the pot. Transfer the pot to the oven and cook until meat the is tender, about 2 hours. 3. While the meat is cooking, heat 1 tablespoon olive oil in a deep skillet or large pot over medium heat. Add the carrots, onion, rutabaga, and parsnip and lightly season with salt. Saute the vegetables until they brighten in color and begin to take on a golden hue, 2 to 3 minutes. 4. 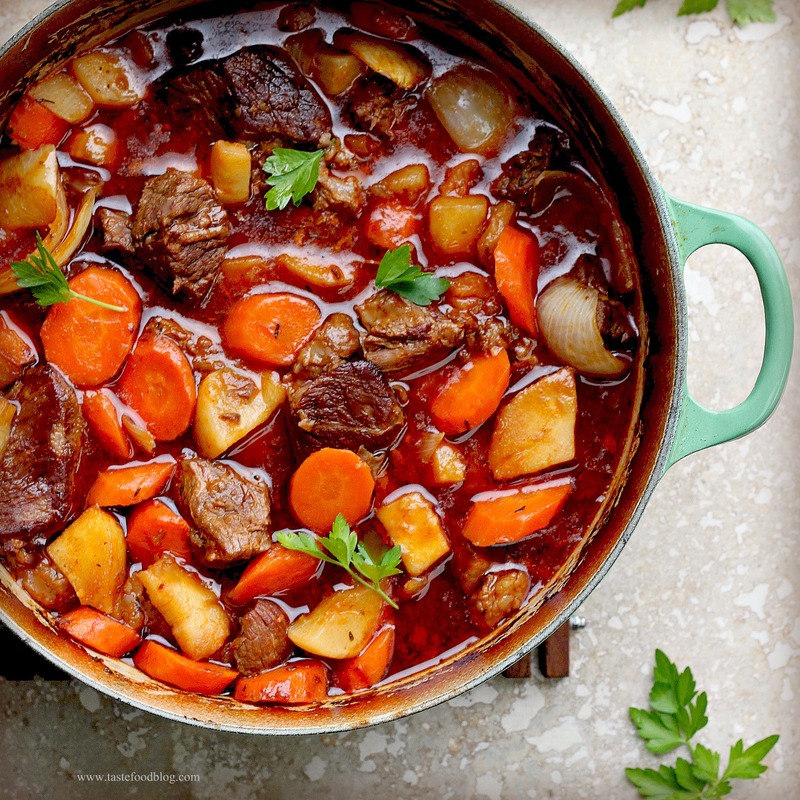 Remove the stew from the oven and skim any fat on the surface of the liquid with a spoon. Stir in the vegetables and return the pot to the oven, uncovered. Cook, stirring once or twice, until the sauce is slightly reduced, the vegetables are tender, and the meat is fork-tender, about 1 hour. Remove the stew from the oven and taste for seasoning. Serve hot with mashed potatoes. That stew looks mighty tasty and mouthwatering! A great dish. If this stew is humble, I think that’s the best kind of stew. Beautiful! I don’t pay much attention to St. Paddy’s Day either, but I promise I would if I had a big bowl of this deliciousness staring up at me. I always love your photos. This one is particularly amazing, as is the recipe. Oh Lynda, you are making me sorry we just polished off the last bottle of Guinness! The stew looks delicious. I think I’ll give it a try with a bit of Lagunitas IPA (our favorite for the other 364 days of the year)! oh this look goooooood! I love the layer or red grease lingering on the top. Gimme a big old piece of bread right now! Love this, Lynda! It looks so colorful and flavorful, and I bet it was absolutely delicious. I agree about St. Patrick’s Day. Last time I checked, mint and green food coloring weren’t Irish ingredients but it sure is fun to play with different ingredients in cooking. Declared “A keeper! Definitely.” by my husband. It really was great. Thanks for the recipe. My stomach just took a bite out of my rib cage. I’m sitting here starving, and the wife has my car. Then, as luck would have it, I stumble across this picture of what has to be the holy grail of comfort foods. 🙂 … anyhow, looks pretty good. I recommend using turnip instead of parsnip. Parsnip was too sweet in such a savory dish. Also, try it in the slow cooker! Yum! Just add more broth, Guiness, and paste. No oil or browning necessary. Cook on low for 6 hours. Thanks for letting me know! Sweet potato is a great addition. Cooking it right now. Can’t wait to taste it. Hope hubby will enjoy after a cold fishing trip. Thank you for the recipe. My husband and I were married on St. Patrick’s Day last year so I was looking for a great, authentic meal to make for our anniversary. Thank you for the inspiration. What can I use in place of vegetables mentioned? Don’t think my husband would eat rutabaga or parsnips! You can simply increase the amount of onions and carrots if you like. Or add potatoes. The beef/Guinness/heaven is cooking in the oven, the veggies are chopped and ready to go. Got some beautiful rainbow carrots to add another layer of color. They are so pretty! Making exactly like the directions, though I did feel a little guilty finishing off the bottle of Guinness given it isn’t 9 a.m. 🙂 Okay not so guilty, didn’t want it to go to waste! So can’t wait for this to be ready! If you are heading for multichannel surround sound, you’ll be wanting from five to eight speakers. To be frank, excellent music mainly relies on the proper audio cabling system. How could this kind of music enthusiast not have a property music system in their own house. Served this to one of my sons and his wife. They keep asking when am I going to make it again? It is delicious! I’m making this for the 1st time. I also only had Blue Moon on hand so I used that. It’s in the oven now. I hope it tastes as good as the picture! I’m going to add green food coloring to my milk for the mashed potatoes. This is going to be a fun Paddy’s Day!!! Let me know how it turns out. Happy St. Pats Day! Pingback: Garlicky Beef Stew | Never Enough Thyme — Never Enough Thyme - Recipes with a slight southern accent. Tried it with garlic mashed potatoes. It tasted AMAZING! My friends and family loved it and its gone so quickly…this recipe is definitely a keeper! Thank you very much for sharing.